This is the best shooting board I have ever used. I believe it is probably the best available anywhere. Tico Vogt made it and he can make one for you – the Super Chute 2.0. A shooting board is an extremely useful, almost magical, tool that can greatly elevate your control of woodworking processes. 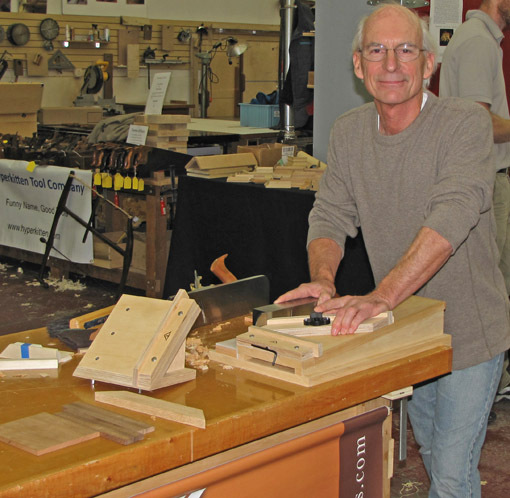 After watching Tico develop and improve his version of this tool, I finally had a chance to use it last week at a Lie-Nielsen Hand Tool Event at the Connecticut Valley School of Woodworking. That’s Tico in the photos using his Super Chute 2.0. It was like slicing baloney with a sled on an ice track. Tico showed me the tool’s incredible quality details and nuances that only could come from a seasoned woodworker who knows from experience what really works in the shop. To elaborate on all of them here would make this post too long, but I will point out a few highlights. The plane rides on a track of super-slick UHMW plastic. Importantly, the work piece sits on an angled bed which facilitates a strong stroke with the plane and distributes wear and cutting resistance over a greater width of the blade than a flat bed would. The 90̊ and instantly-installed 45̊ fences register in eccentric bushings which make their angles micro adjustable. The fences are also laterally adjustable to completely eliminate end grain spelching. To my mind, these user-controlled features respect the skill and intelligence of the craftsman using the tool. A donkey ear miter attachment that installs easily is also available. Tico uses CNC technology and sources components manufactured with a high degree of sophistication to a produce a product with quality evident throughout. No, it’s not cheap; excellence never is. This is Lie-Nielsen-type quality in a shooting board. A plane such as L-N’s sweet #9 makes shooting all the more of a pleasure but don’t feel you must have a dedicated miter plane to start shooting. A well-tuned and well-sharpened jack plane, bevel-up or bevel-down, can shoot very effectively. Shooting is a gateway technique, easily learned, that will allow you to produce precise ends on components of casework. 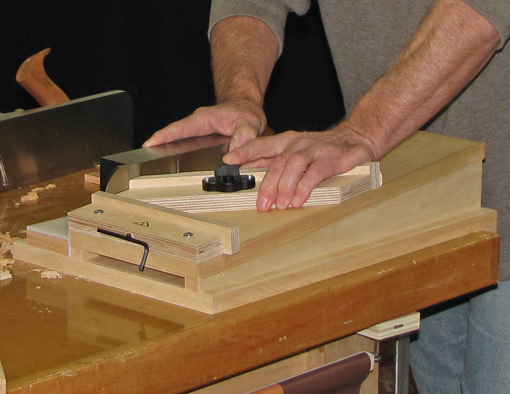 It is a must for making precision high-end drawers with hand tools. This review is unsolicited and uncompensated. I just think the Super Chute 2.0 is a heckuva tool. I’ve been looking at the Super Chute for awhile, I just might take the plunge. I do see that #51 looming in the background of his photo, but are you saying that it works well with the relative light weight of the low-angle jack? Thanks for the review. I couldn’t agree more Rob. I have version 1 of the super chute and have been using it for more than a year. I love it. Tico sent me version 2 just before WIA and I have been working with it. This version is so much better! Look for a video on it coming soon. Also I see Tico has added a magnet for the Allen key in the back of the fence. I would like to claim that idea, but when I mentioned it to Tico, he already had it in the works. Expect his products to just keep getting better. I shoot with a L-N #9 miter which I like a lot, but, yes, a BU or BD jack works very well too. Of course, a sharp blade is essential for any plane you use. I do think that the bevel-up planes have an advantage due to a thick blade being supported closer to the cutting edge, but the bevel-down planes work well if they are well-tuned, especially the chipbreaker/cap iron. I prefer to grip the body of the plane over its throat (with the “hot dog” handle on the #9) and drive the plane with the heel of my hand, pushing my body weight into the stroke from the legs and hips. Couldn’t you just make one for next to nuthin with scrap wood? Yes, sure. That is always the question that arises with this sort of tool, and it is a fair question. As with most things, there are different levels of quality. I think if you or I tried to make a ramped shooting board with the features, accuracy, and versatility of the Super Chute 2.0, we would find it very difficult to achieve and, ultimately, not worth our shop time. Likewise, a low-budget import smoothing plane costs a small fraction of a Lie-Nielsen and is still a serviceable tool. It’s a question of what how you want to work, what you can afford, and what you can build in your shop. In any case, quality matters. Thanks for the question, and thanks for reading.